Today's theme is Antique. I took a couple of laps around the house searching for something that resembled an antique that would also make a cool photograph. 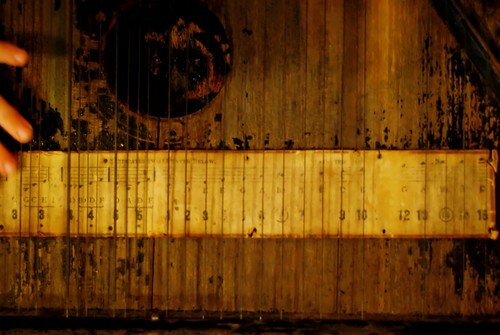 As I was glancing around I saw the old string instrument hanging on the wall that we bought at a flea market. I took it off the wall to get a better photo. The kids immediately flocked to it. They would not keep their hands off the thing. I am not exactly sure what it is, but I think it is a Zither or Autoharp. I really wish I knew the history behind this instrument. I would love to be able to share a story or tell you it came from my great great grandfather. Truth is, we just thought it would look cool hanging on the wall. I guess we will just have to leave the story to our imaginations. See what everyone else came up with over at The Land of K.A. I can see the music more clearly. what a fascinating piece to have. i like the middle one best. go ahead and make up a fabulous history for it -- no one need know it's not true :). Wow! That instrument is the coolest! You should have made of a fantastical history for it - we'd have never been the wiser. ;o) It is absoltuely beautiful. I think the last one is my favorite, too, for the reason Tanya said - seeing the music clearly. I have to agree with you it totally makes a cool wall hanging. You guys could always make up a story about it. Do a little research about what it is and when it was probably made and let the kids fill in the gaps. Could make for a fun story. Great pictures of it! I love that last one, the close up with the aging piece of music. I do believe that is a Dulcimer (aka. 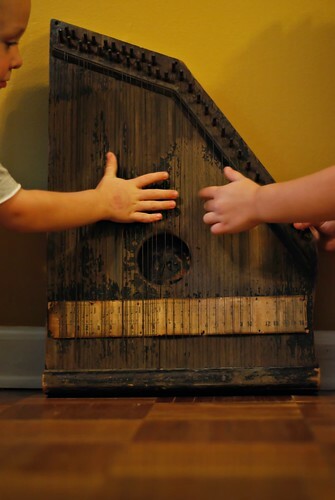 zither harp)...the name differs depending on where you're at. I love the last photo! The blue tinting is beautiful! But I also love the middle photo. Hard to choose which is my favorite. Great find. 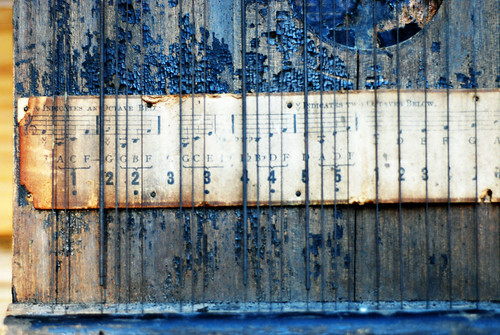 AWESOME instrument and shots...I love the last one! Yup, the last one is my favorite too. It is such a cool instrument and a great find. Just thinking about where it came from and its history makes it an interesting shot. You have cool wall art! I love the last two pictures, too. Especially the blue one.